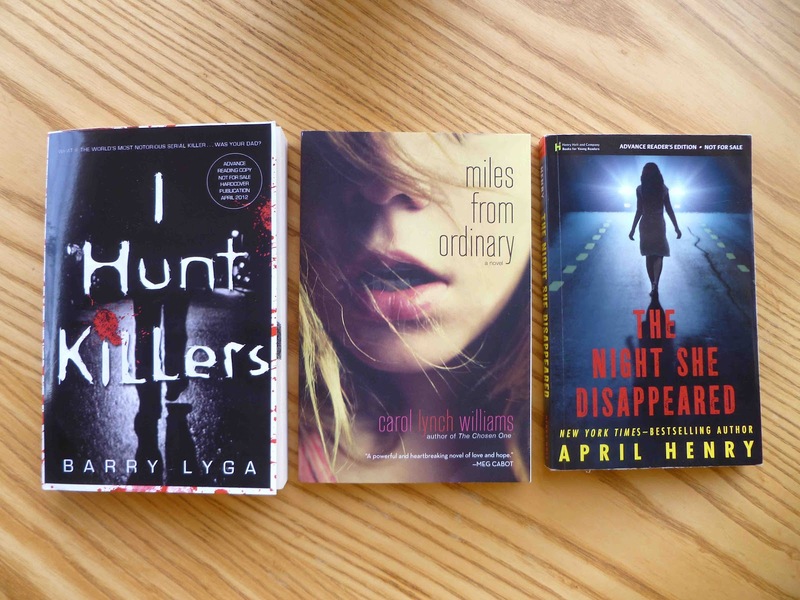 Spring YA Suspense ARC Bundle Giveaway! We love a good mystery, don’t you? There have been some great YA titles released this spring, so we’re celebrating by giving you a chance to win some of the books that are getting lots of buzz! We did a mini-tour for The Night She Disappeared, by the way, so check out Rachel’s, Arlene’s, Crystal’s reviews if you’d like to see their reactions. We’ll have a review round-up for the mini-tour we did for I Hunt Killers soon, too. All you have to do is use the Rafflecopter form to leave your email address AND leave us a comment below telling us what your favorite mystery/suspense novel is. You’ll also get extra entries for sharing the post on Facebook, pinning it on Pinterest, etc. And yes, this contest is open internationally. Good luck! Our sincere thanks to Macmillan Teen, St. Martin’s Press, and Little Brown for their genorosity in furnishing the prizes. Nerd Alert: SDCC 2013 recap and HUGE giveaway! And I also love the Bernard Rhodenbarr series by Lawrence Block. Would it be sad to say anything Nancy Drew? I know that there are scary mysteries out there, and they are children’s books. They just hold a special place in my heart, because those mysteries got me reading. I think they will always be my favorite. maybe the silence of the lambs? i remember it being very creepy. thanks for the giveaway. 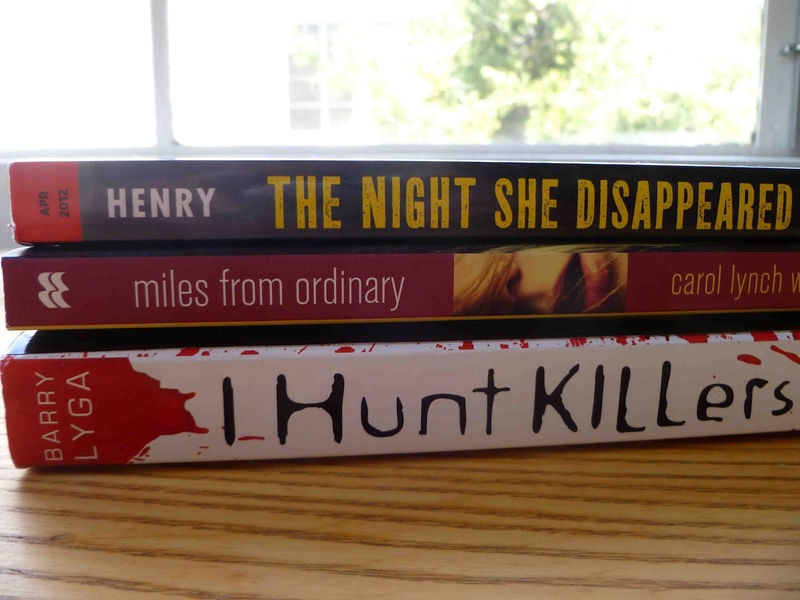 i am dying to read i hunt killers! I really love the Aurora Teagarden mysteries by Charlaine Harris – quirky heroine, fun and keeps you guessing which a mystery should! Nothing YA so far! I like Michael Connolly and Robert Ludwig, I really need to get my hands on more YA thriller/mystery. I loved ULTRAVIOLET, and I hear really great things about NAME OF THE STAR. :)Nice picks! Your question makes me realise that I don’t read as many Mysteries as I’d like! The Arm of the Starfish by Madeleine L’Engle is an old YA Suspense novel that I discovered as a teen and that still managed to keep me on the edge of my seat although I knew from the beginning who the good guys were. Thanks for this chance to win some great ARCs! I like this dutch writer Helen Vreeswijk’s books. They’re very exciting eventhough it’s in dutch and I normally read english books. I am incredibly old school, so as far as YA mystery/thrillers go, I never get tired of Nancy Drew. Low stakes sometimes, and definitely hit/miss, but… It’s Nancy. I definitely prefer the older ones, though. My absolute favorite mystery/thriller series is the “Mistress of the Art of Death” series by Ariana Franklin. Favorite mystery/suspense? Oh wow, I don’t even know. I was a huge fan of Stephen King for awhile, but then I found YA (yes, I did it backward haha). I loved Ruined by Paula Morris. How about Possession by AS Byatt. It’s not a traditional “mystery” but there’s a huge mystery element in the search for the secret lives of the poets. I loved Imaginary Girls by Nova Ren Suma, it kept me in suspense till the very end, and what a great mystery book! IMAGINARY GIRLS was one of my favorite books last year! I hope we get more news about the author’s next book soon, her inspiration board on Pinterest is pretty creepy and beautiful. Regarding mystery novels, I choose “Bag of Bones” by Stephen King and “And There Were None” by Agatha Christie. Stephen King is mostly categorized as “horror”, but many of his novels, IMO, are supernatural mysteries; Bag of Bones is one of them. There’s also Hearts in Atlantis (one of my favorite books by him) that has some supernatural elements, but it’s not necessarily horror. Stephen King is my favorite author of all time. I loved Bag of Bones, but my favorite book by him is It, then The Shining then 11/22/63. Most people are shocked that The Stand isn’t in my top three, but it’s #4. I think Bag of Bones may be #5. Did you watch the mini-series? I was going to but I heard it was horrible so I deleted it off my DVR. If I ever have the urge to watch it, it’s on Netflix. Mine is Shutter Island by Dennis Lehane! I really enjoyed the Wake Series by Lisa McMann and The Unbecoming of Mara Dyer by Michelle Hodkin. Thank you for letting me read the ARC for The Night She Disappeared. It was great! So I’m dying to try the other two. I really want to read The Unbecoming of Mara Dyer! It’s gotten mixed reviews but sounds really good. Mine is The Pineville Heist by Lee Chambers! I used to love the Clue books because I was always really goo at figuring out who done it. Hi! Thanks for this giveaway! I really enjoy Katy Reich mystery/thriller! A lot of them are taking place in Montreal, where I live so it’s pretty nice! I really enjoyed Fury by Shirley Marr. I love the murder mystery as well as psychological aspect of it, all set in high school. Forgot to say thanks for the awesome giveaway! Hi Wendy. Thanks for the mention up there! April’s book the Night She Disappeared was a great mystery/suspense read. But a modern mystery series I loved was from Lisa Gardner. Quincy and Rainie in The Third Victim was really good! I’ve enjoyed the LG books, too–my sister is currently making her way through them! My experience in this genre is actually, you can say, limited. I read a lot of Sidney Sheldon’s books and Agatha Christie’s ones, but still I think I don’t have an adequate experience with this genre since I have only read books written by those two authors, which explains why I can’t really pick, as it’ll do injustice to other mystery/thriller authors. But I love Sheldon’s books! What’s your favorite mystery/thriller and why? I don’t really read a lot of books that I consider to fall just under mystery or thriller. Seems like there is always some other prominent element involved. However, I love the Mercy Thompson series by Patricia Briggs. Each book in the series always has elements of both a mystery & thriller. Any book by Agatha Christie would be my favorite mystery. my favorites by her are The murder of Roger Ackyrd, Ordeal by Innocence, Destination Unknown. Anything by Lisa McMann and the Newflesh trilogy by Mira Grant. I love them so muchhhh! I Love The Millennium series by Stieg Larsson! I loved Nancy Drew and The Hardy Boys when I was actually a young adult. The Secret Adversary and Partners in Crime are my two favorite Agatha Christie books. My favorite mystery suspense series is the JD Robb In Death books – especially since I get my sf fix as well. My favorite mystery/suspense is Haunted by Chuck Palahniuk. I also really loved thirteen reasons why by Jay Asher but I’m not sure if that one’s considered suspense or not. Thanks for the giveaway and good luck with the IBBA’s. I’ll be voting for you! I really like Agatha Christie. I think And Then There Were None is great. Breaking Beautiful by Jennifer Shaw Wolf and The Thirteenth Sacrifice by Debbie Viguie! Those two books are AMAZING!!!! I don’t normally read mystery, but I have to go with Girl with the Dragon Tattoo – just finished it and loved it! I love Ms. Tami Hoag’s early mysteries. Great, great reads! I haven’t read a mystery/thriller in the longest time but I heard Barry Lyga read from I Hunt Killers this past weekend and I have to say, I was intrigued. When I was younger I used to love love Nancy Drew and Mary Higgins Clark if that counts. I’m not sure why I stopped reading those… Great giveaway! Just discovered your blog and looking forward to catching up in my reader. Great giveaway! I’m not entering because I already have I Hunt Killers waiting on my shelf, and I honestly don’t need to add the others to it, but they all sound great! Aw, thanks for stopping by, Jeannette. I can’t wait to hear what you think of IHK! I think one of my recent faves is The Professionals. It was great how the “bad guys” were the ones I was rooting for, which is an odd thing with kidnappings! I don’t as such have a favourite (I never do) so I’ll just name the last mystery/thriller I really liked which was Crooked House by Agatha Christie. AMAZINGAMAZINGAMAZING! It’s the classic expect-the-unexpected ! thanks for the giveaway! I think I would say the Douglas preston and Lincoln child series, it’s really amazing, a lot of good ideas in it. I’ve always loved Dean Koontz. I haven’t read any of his books in awhile, but he remains a favorite author of mine. Well. I’m not entirely sure if it can be called a thriller/mystery or not so don’t hate me if I’m wrong. But I did enjoy The Body Finder by Kimberly Derting. One of the things that made it good was the fact that it wasn’t just from one POV. I can’t think of my fav Thriller/Mystery but I know I would love to read The Girl with the Dragon Tattoo. I heard that one is a lot of people’s favs. My favourite mystery . . . anything Nancy Drew. The classics! But I also loved The Unbecoming of Mara Dyer. Thanks for the giveaway! I have only started to get into mystery novels but I have enjoyed Deadly Cool by Gemma Halliday a lot and anxiously waiting for Social Suicide to come out. Thanks again for the Giveaway Opportunity. Can’t wait to hear about other great books! My favorite mystery I read is ordeal by innocence by agatha Christie! My favorite mystery I listened to by audiobook is a book I nicknamed creepy book, Door to December by dean kootz! I absolutely adore The Agency series by YS Lee, and I also loved The Butterfly Clues by Kate Ellison! I forgot ‘why’…The Agency because Mary Quinn is awesome and they’re such addictive reads, and The Butterfly Clues because it was so tense, trying to figure it all out, and I loved how it all came together with links to Lo and her brother! by E.L. Konigsburg because they were my firsts and started me on my love of mysteries! I haven’t read a lot of books in the mystery/thriller genre, but I’ve been looking into reading a few recently. Those all look fantastic! I’m fairly new to the mystery/thriller genre as a whole, so I can’t really say I have a favourite yet. But I’ve taken note of the recommendations on the comments here, so I’ll be sure to check them out! I really liked Slide by Jill Hathaway because it had a paranormal twist. My most recent fave mystery is Fury by Shirley Marr and as for mystery/thrillers I used to read a lot Patricia Cornwall/Michael Connolly but I don’t have the time any more. That’s a tough one! I suppose recently I have really liked ‘The Expats’ by Chris Pavone. However, I am a Sherlock Holmes girl at heart. The classic mystery still holds up today. 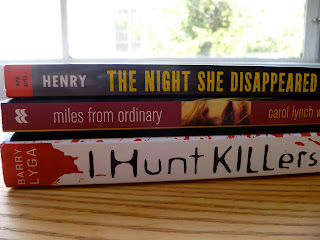 I haven’t read any mystery/thriller books in awhile. Not mainly anyway, probably just a dash of m/t in the ones I’ve read. I’m definitely looking forward to I Hunt Killers though. I guess the best out of the ones I have read has to be Angels and Demons by Dan Brown. It had me pretty engrossed. Right now I’d have to say The Night She Disappeared. I read that on netgalley. It was creepy. Oh, I loved the first Sally Lockhard mystery when I read it as a teenager, Maree! I think I may have to reread that again this year. I love Philip Pullman, too. 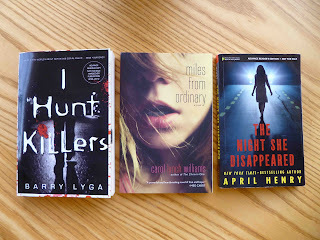 I don’t read a lot of mystery/thrillers, since it seems hardly anyone publishes a mystery/thriller anymore, but Pretty Little Liars wasn’t too bad. Thirteen Reasons Why was alright, too. Honestly? >_> I have a really awful time remembering, so I’m just going to say one that I am about 30 pages from finishing and completely i love with: A Million Suns. It’s as much a mystery/thriller as a sci-fi, and it’s absolutely incredible. The writing, the characters, and the crazy, ridiculously complex plot–high levels of awesome. I love it. My favorite thriller is one I just read called Ripper. I was surprised that I enjoyed it so much since I am not into thrillers very much. My favorite mystery/thriller would probably be and of the Hannibal Lecter books. I really enjoyed The Insider. It is a legal thriller, and it was really good. I love Nancy Drew but Untraceable by S.R. Johannes is a great mystery thriller!!!!! SO good!!! Thanks for the great giveaway! I love suspense/thrillers. One of my favorites is Sharp Objects by Gillian Flynn! Probably The Talented Mr. Ripley by Patricia Highsmith. It’s a classic for a reason; it’s just so well-written and creepy. If you haven’t read it, you definitely should! I love love loved the Wake series by Lisa McMann. It just had such a different, fresh writing style that I read them ALL in a day and a half. When it comes to mystery, I very much enjoy reading Skandinavian authors. I really like Henning Mankell’s novels and also Stieg Larsson’s trilogy … I actually haven’t read that many YA mystery books, but I’m looking forward to changing that ;). My favorite mystery series is the Haunted Guesthouse series by EJ Copperman -they’re so much fun to read! I loooove Beautiful Malice by Rebecca James and Entangled by Cat Clarke–really thrilling and hit me hard! I love Mara Dyer and the Sookie Stackhouse series because they always have great suspense and male leads to die for! My favourite mystery is definitely The Alienist by Caleb Carr, it pushes my every crime fiction button. I love Mystery and Thrillers. I really enjoyed The Unbecoming of Mara Dyer, I also read The Night She Disappeared and I enjoyed it, but wish there had been more actual mystery to it. I grew up loving Dean Koontz. He writes amazing Thrillers!! My favorite young-adult mystery/thriller would probably have to be The Weeping by O’Dell Hutchison! Adult mystery/thrillers? Anything by Tess Gerritsen, Leonard Goldberg and Lisa Gardner. They’re amazing writers! I’m a fan of Tess Gerritsen’s to, Shana–I will have to check out those other authors you mentioned! To pick one title is very hard for me. I love Mary Higgins Clark, Jonathan Kellerman, James Patterson to name a few authors. Mystery/ suspense is one of my favorite genres. Thank you so much for this giveaway!! As a child, I was really haunted by Phyllis Reynolds Naylor’s Jade Green. So that’s my pick! Recently read, He Kills Me, He Kills Me Not, by Lena Diaz. It was a great read. Also love anything by Nina Bruhns. Favorite mystery – hmmm…I used to read mysteries a long time ago. Maybe Faye Kellerman’s Peter Decker series…Old favorite. I really love Millenium by Stieg Larsson. It´s mystery, thriller and for me kind of horror, but I really like it. I have read all the three books in like two days and it was absolutely epic! I’m racking my little brain trying to come up with something… eeeeeek. Um…. I guess I’m gonna go with the Fever series by KMM. I mean, it’s a mix of everything, UF, thriller, mystery, romance. Highly addictive! I love anything by Betsy Brannon Green. I loved Wake and Mara Dyer. For me that was real suspense! I have only read I’m legend by Richard Matheson but it was fantastic and the movie too! Probably Sookie Stackhouse series even though it’s more of a scifi. It could be seen as a mystery/thriller since it was suspenseful and has lots of questionable characters. After reading your review on I Hunt Killers, I want this book sooooo badly! I love the thriller series The Devouring by Simon Holt…really creepy.